Summary: Danny’s mother lost her five-year battle with cancer three weeks before his graduation-the one day that she was hanging on to see. Review: In a literary landscape where fantasy and dystopian novels are best sellers, it is nice to have a quiet novel. A novel that explores the human condition in a beautiful, yet understated way. A novel that allows the reader to connect with a character as he or she grows and comes to understand meaning in the small things in life. “When You Were Here” is such a novel that examines life after a loved one succombs to cancer. It’s a beautiful story that explores grief and then finding acceptance after death. What I really liked about this novel is the fact that this touching story is told from a male’s perspective. 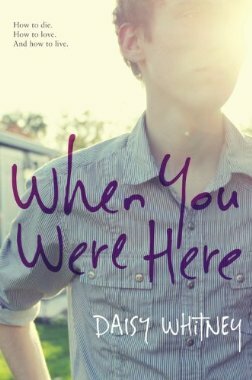 Having a male narrator/main character in YA literature is somewhat of a rarity and I enjoyed reading Danny’s discovery of the last few months of his mother’s life, especially her time in Japan. Danny is unflinchingly honest about his feelings – his anger that his mother wasn’t able to see him graduate from high school, his love for his ex-girlfriend Holland – as he works through the stages of grief and in the end discovers himself. By learning to be honest with himself, he learns how to ask the questions he needs from the people who knew his mother and to be honest with Holland. I loved the fact that the character’s spoke to each other instead of a book filled with misunderstandings. It was clear that Danny had a healthy relationship with his mother, told through touching flashbacks, that helped him become the young man who is able to handle becoming an orphan at the age of 18. His maturity doesn’t seem forced, in that children with ill parents are often much more mature than their counterparts. It is because of this attention to character detail that makes Danny feel very real and relatable. Last week I wrote about creating diverse worlds, even when having main characters who are Caucasian, as “When You Were Here” does. I wasn’t even thinking about this novel when I wrote the article, but the world Danny lives in is a perfect example of a diverse world. The novel begins in Los Angeles and Whitney makes sure to make Danny’s world a reflection of the multicultural city that is Los Angeles. I was definitely able to relate to the city presented in this novel because it is the world I live in. When the novel moves to Tokyo, Whitney doesn’t treat the city as a novelty, but as a real place where people live and work. In fact, Danny loves Tokyo and that love is clearly presented. Danny doesn’t view Tokyo with a tourist’s wonder, but as a citizen of the city and in the end, he calls it home. I do not know whether Whitney actually visited Japan, but she definitely completed thorough research into local customs, beliefs, language as well as most likely asked the right questions about Japanese culture. Her careful attention shows the respect it takes when writing another culture when one is the other and I commend her for it. While I didn’t read this by the beach, “When You Were Here” is beach reading material and the perfect companion for summer.